Many countries require visiting yachtsmen to hold a certificate of competence. If you are planning to sail or cruise within Europe and the Mediterranean the RYA recommends skippers to hold the International Certificate of Competence (ICC). This qualification is available to BRITISH CITIZENS or bona fide BRITISH RESIDENTS. 1. If you are an RYA member and have already obtained your Day Skipper certificate, send the ICC application form and a photocopy of your Day Skipper certificate or above to the RYA. For clarification please consult the list of certificates eligible for conversion on the back of the ICC application form. Available to download from the RYA site. 2. By taking a practical test at a RYA Training Centre or a RYA Affiliated Club authorised to carry out ICC tests. The syllabus is outlined in the form. The test lasts approximately half a day and can be taken on your own boat or one provided by a school or club. The test includes; questions on safety, collision avoidance and for coastal waters; navigation and piloting. The type of centre or club you will need to approach for a course or assessment will depend on the type of vessel you will be operating. If you are intending to take a boat through the European Inland Waterways system, i.e. canals, rivers, lakes etc. applicants must have passed a test called the CEVNI (European Inland Waterways Regulations) at a RYA Training Centre or RYA Affiliated Club authorised to carry out tests. The CEVNI test is a multiple choice paper of 14 questions. 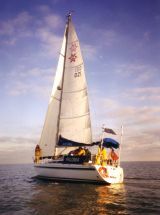 The pass mark is 11 and usually takes about 10 minutes, is now an online course at RYA interactive. Candidates must also be aware of the ATIS regulations. Recommended Reading – The RYA ‘ICC Handbook’ book. The CEVNI rules can be found in the ‘RYA book ‘European Waterways Regulations’. ‘Foreign Cruising 1 & 2’ is essential reading for planning a cruise abroad, giving precise information on relevant documentation and certification when cruising in each country. Once you have passed the practical ICC and CEVNI requirements, you will then have to submit evidence of qualifications to the RYA in order to have your International Certificate of Competence issued. If you are an RYA member your ICC will be issued free of charge. If you are not an RYA member there is currently a fee of £38.00. There is an option to fast track your application (in two days) for an additional fee of £10. Our advice would be that you join the RYA, not only for the savings it brings you for your ICC, but also for the other services they provide to boat owners. Any country issuing ICCs can only do so to its own nationals or residents. The candidates must be at least 16 years old, be physically and mentally fit, and in particular must have sufficient powers of vision and hearing.